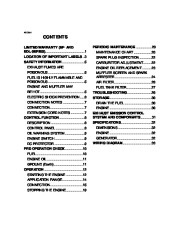 Generator OWNER’S MANUAL EF2400iS LIT-19626-01-23 7CF-28199-10 AE00002 INTRODUCTION Congratulations on your purchase of your new Yamaha. 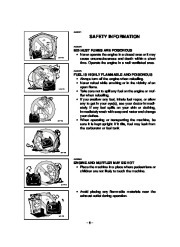 This manual will provide you with a good basic understanding of the operation and maintenance of this machine. If you have any questions regarding the operation or maintenance of your machine, please consult a Yamaha dealer. PRI-I.D. 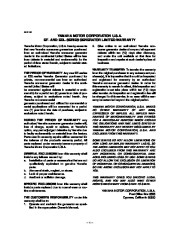 NUMBER MODEL PRI-I.D. 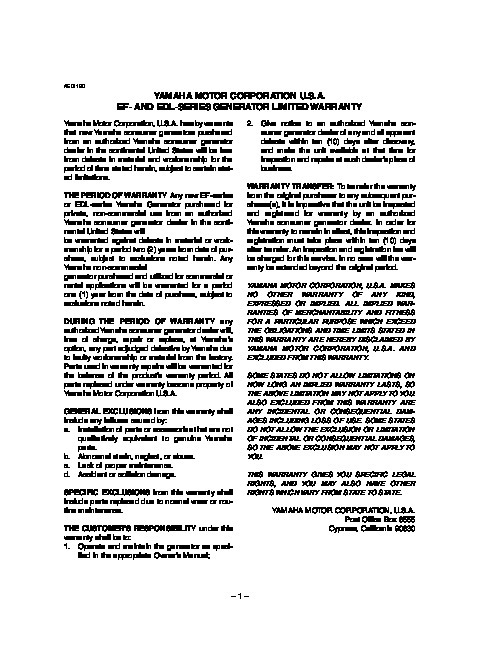 CODE AE00012 SERIAL No. 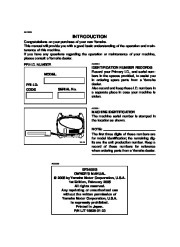 IDENTIFICATION NUMBER RECORDS Record your Primary I.D., and serial numbers in the spaces provided, to assist you in ordering spare parts from a Yamaha dealer. Also record and keep these I.D. numbers in a separate place in case your machine is stolen. 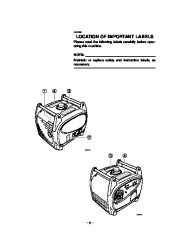 AE00011 MACHINE IDENTIFICATION The machine serial number is stamped in the location as shown. NOTE: The first three digits of these numbers are for model identification; the remaining digits are the unit production number. 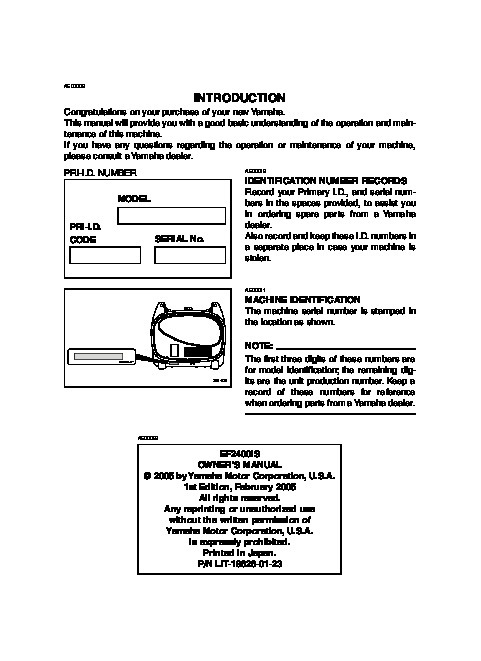 Keep a record of these numbers for reference when ordering parts from a Yamaha dealer. 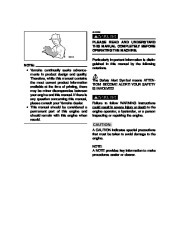 7CH-24163-** 790-072 AE00022 EF2400iS OWNER’S MANUAL 2005 by Yamaha Motor Corporation, U.S.A. 1st Edition, February 2005 Any reprinting or unauthorized use without the written permission of Yamaha Motor Corporation, U.S.A. is expressly prohibited. Printed in Japan. 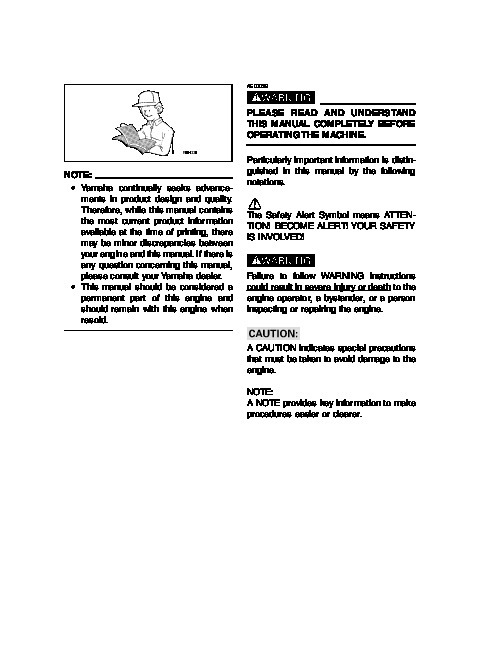 P/N LIT-19626-01-23 AE00032 w PLEASE READ AND UNDERSTAND THIS MANUAL COMPLETELY BEFORE OPERATING THE MACHINE. 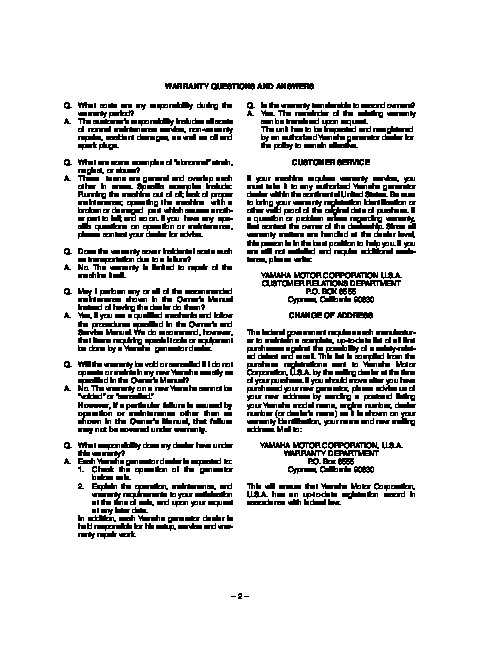 Particularly important information is distinguished in this manual by the following notations. 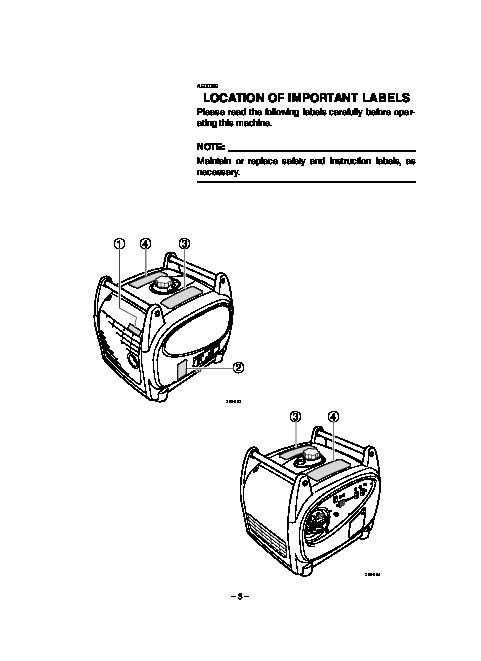 NOTE: 9 Yamaha continually seeks advancements in product design and quality. 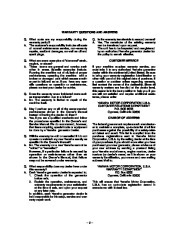 Therefore, while this manual contains the most current product information available at the time of printing, there may be minor discrepancies between your engine and this manual. 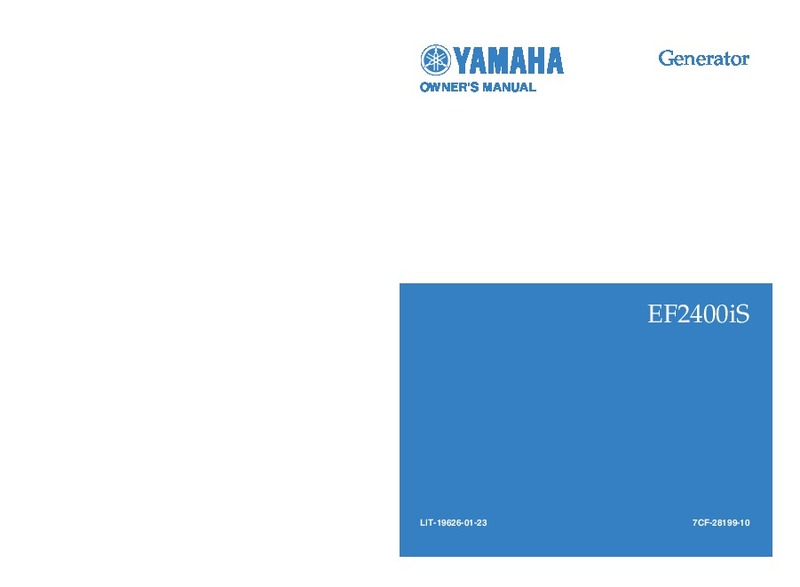 If there is any question concerning this manual, please consult your Yamaha dealer. 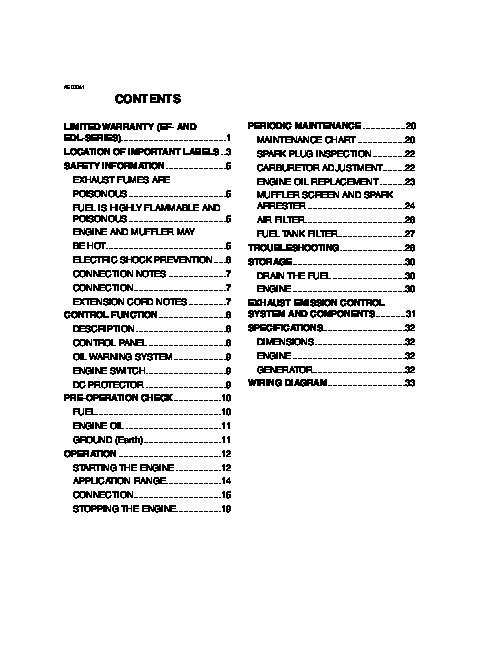 9 This manual should be considered a permanent part of this engine and should remain with this engine when resold. 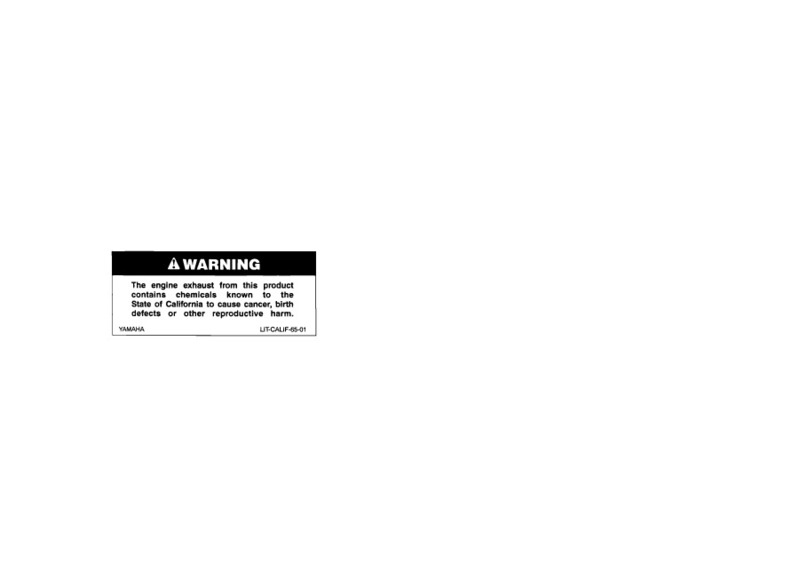 The Safety Alert Symbol means ATTENTION! BECOME ALERT! YOUR SAFETY IS INVOLVED! 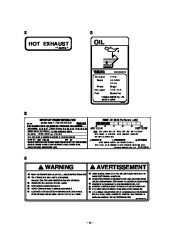 w Failure to follow WARNING instructions could result in severe injury or death to the engine operator, a bystander, or a person inspecting or repairing the engine. 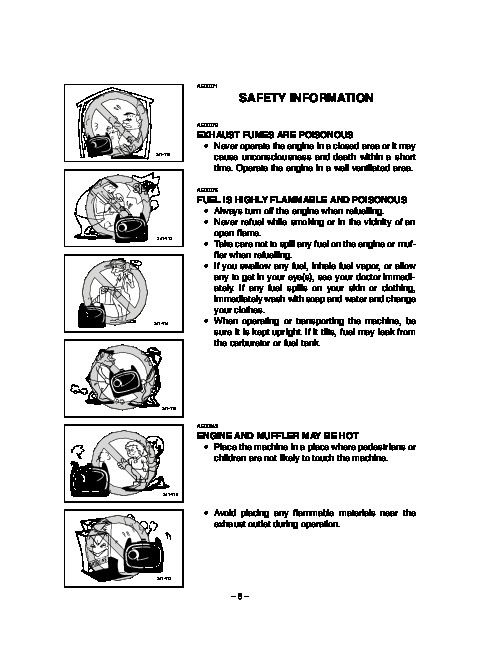 cC A CAUTION indicates special precautions that must be taken to avoid damage to the engine. NOTE: A NOTE provides key information to make procedures easier or clearer. 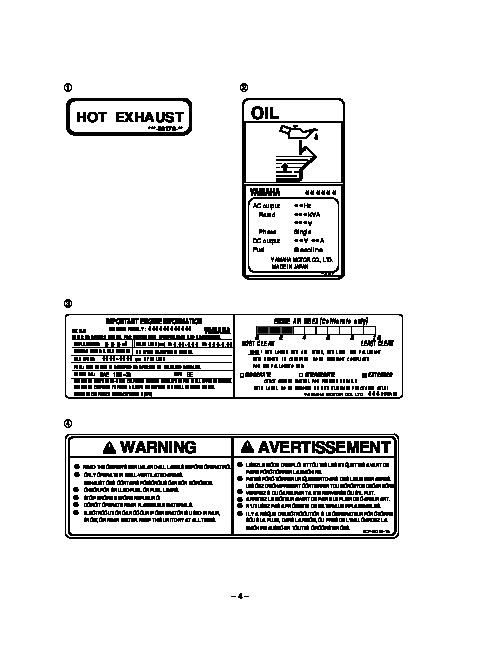 AE00041 CONTENTS LIMITED WARRANTY (EF- AND EDL-SERIES) 1 LOCATION OF IMPORTANT LABELS 3 SAFETY INFORMATION 5 EXHAUST FUMES ARE POISONOUS .5 FUEL IS HIGHLY FLAMMABLE AND POISONOUS .5 ENGINE AND MUFFLER MAY BE HOT 5 ELECTRIC SHOCK PREVENTION .6 CONNECTION NOTES .7 CONNECTION .7 EXTENSION CORD NOTES .7 CONTROL FUNCTION .8 DESCRIPTION 8 CONTROL PANEL .8 OIL WARNING SYSTEM .9 ENGINE SWITCH 9 DC PROTECTOR 9 PRE-OPERATION CHECK .10 FUEL 10 ENGINE OIL 11 GROUND (Earth) .11 OPERATION .12 STARTING THE ENGINE 12 APPLICATION RANGE 14 CONNECTION .15 STOPPING THE ENGINE 19 PERIODIC MAINTENANCE .20 MAINTENANCE CHART .20 SPARK PLUG INSPECTION .22 CARBURETOR ADJUSTMENT .22 ENGINE OIL REPLACEMENT 23 MUFFLER SCREEN AND SPARK ARRESTER .24 AIR FILTER 26 FUEL TANK FILTER .27 TROUBLESHOOTING 28 STORAGE .30 DRAIN THE FUEL .30 ENGINE .30 EXHAUST EMISSION CONTROL SYSTEM AND COMPONENTS 31 SPECIFICATIONS .32 DIMENSIONS 32 ENGINE .32 GENERATOR .32 WIRING DIAGRAM .33 AE01120 YAMAHA MOTOR CORPORATION U.S.A. EF- AND EDL-SERIES GENERATOR LIMITED WARRANTY Yamaha Motor Corporation, U.S.A. hereby warrants that new Yamaha consumer generators purchased from an authorized Yamaha consumer generator dealer in the continental United States will be free from defects in material and workmanship for the period of time stated herein, subject to certain stated limitations.